I've a song about "Goin' to Jackson" starting to haunt me. It started when I received this email. It's too big and important to keep only on the usual posting of MI Story or even on the Bulletin Board page here -- although the Gathering is still on the Bulletin Board. The Evening at the Grand was there, too, and you had an opportunity to be part of the concert because the opportunity to submit a story appeared there. Remember to check that page for "posting of information that may have missed the deadline of the current MI Story issue or to post more complete information than the MI Story email newsletter has room to post." The Bulletin Board page also often includes opportunities to tell stories like that Evening at the Grand submission. Hope you, too, are "Goin' to Jackson"! I wanted to make sure you knew about all the activities associated with this year’s Jackson Storyfest. This a great opportunity for us to come out and support one of the state’s great festivals, enjoy wonderful storytelling and rub elbows with fellow storytellers. I hope you can come and share in the fun. Friday, May 6, 2016, 7:30 p.m. 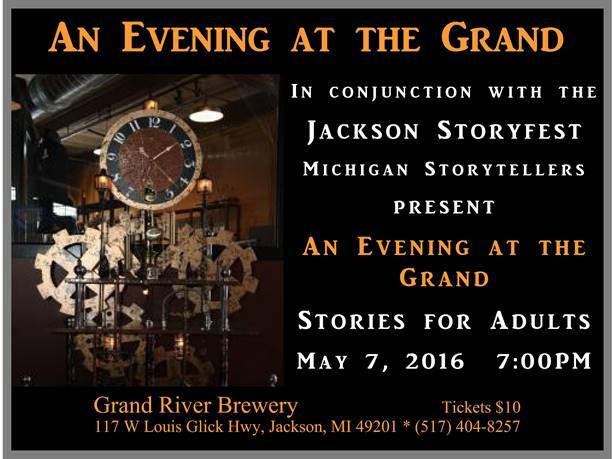 Hosted by the Ann Arbor Storytellers’ Guild. Spend some quality time with fellow Michigan storytellers, catch up on what we’re doing, meet people you’ve only seen on Facebook, try a great workshop and share some stories. Noon –12:45 pm – Bring your own lunch and mingle with your colleagues. 1:00 pm – 2:30 Creativity: Anyone can do it! Learn how to structure an environment conducive to creative thinking. Put your creative mind to work in what is more of a Funshop than a Workshop! A big hit from last year’s Michigan Gathering – whether you are new to storytelling or come with long experience, bring a five-minute story to share. Michigan tell tales to tickle your funny bone and touch your heart.